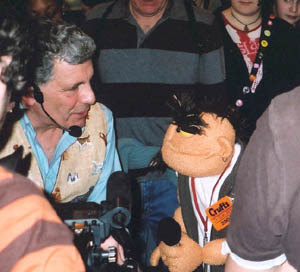 A surreal moment for me at the world's largest canine event was being interviewed by the puppet Little Dave. This was a trailer for a new childrens programme. But what a good idea to use a puppet to get the message across to childen re dog welfare and ownership issues... though the question "Tell me Mr Dog Whisperer, are there such things as gay dogs?" ...did slightly throw me on the first day of Crufts! In fact there are...as some male dogs who when castrated are seen by other dogs as a bit iffy and seem to excude a non male scent and they are then picked upon. Directors / producers please let's pursue this subject matter in more depth..no not the gay dog question - the education role of a puppet such as Little Dave.